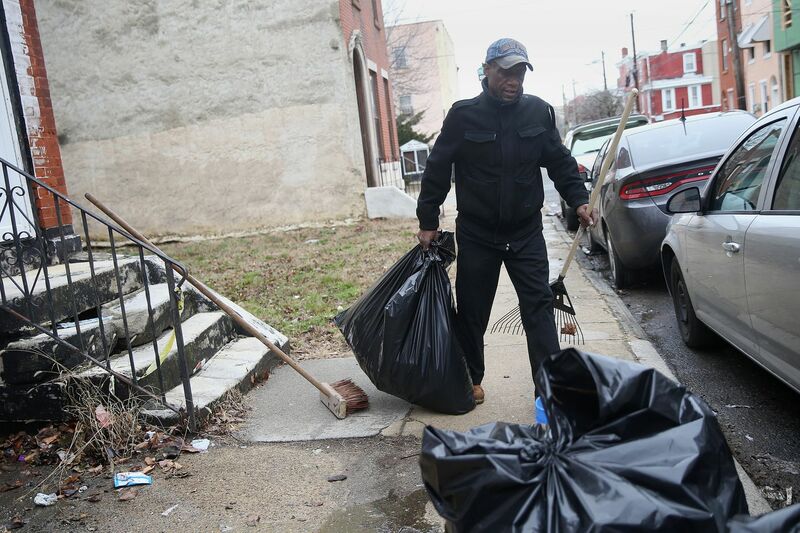 Ernest Gardner carries a bag of trash after raking it off of a vacant lot in North Philadelphia. The city has launched its pilot street-sweeping program, which will target six neighborhoods from April through November. Philadelphia might be on the road to sweeping its Filthadelphia nickname under the rug. City officials, including Mayor Jim Kenney, announced the launch Tuesday of a mechanical street cleaning pilot program, which will target six neighborhoods stretching from Southwest Philadelphia to Kensington. The pilot, running weekly from April through November, will include mechanical-broom cleaning as well as backpack and hand-held blowers, officials said. Residents will be encouraged, but not required, to move their vehicles, Streets Commissioner Carlton Williams said at a news conference. West Philadelphia, Parkside to Lancaster Avenues, 52nd Street to Girard Avenue. Southwest Philadelphia, Woodland Avenue to Kingsessing Avenue, 49th Street to Cemetery Avenue. Kensington, Second Street to Frankford Avenue, Tioga Street to Lehigh Avenue. Strawberry Mansion, Sedgley Street to Lehigh Avenue, 29th Street to 33rd Street. Logan, Godfrey Avenue to Roosevelt Boulevard, Broad Street to Fifth Street. South Philadelphia, McKean Street to Oregon Avenue, Fourth to Eighth Streets. “Watching our city get dumped on day after day seriously burns me up,” Kenney said in a statement. “It is the reason why I have fought to bring back a residential mechanical sweeping program." Nic Esposito, head of the city’s Zero Waste and Litter Cabinet, announced the program this winter on WHYY’s Radio Times. At that time, the city hadn’t settled on which neighborhoods it would hone in on for the program, but Esposito said it would use its “litter index” to help decide. The index ranks streets, parks, recreation sites, vacant lots, and more to determine the most problematic areas. The Streets Department will conduct a “follow-up index” after the pilot. Philadelphia is one of the only large cities without a residential street sweeping program, though until budget cuts about a decade ago, every city block was swept weekly. Resurrecting such a service would cost $5.2 million annually as well as $12 million in equipment costs, The Inquirer reported last February. The estimated cost of additional personnel to implement the pilot will be around $425,000 for the remaining fiscal year, according to the city, while four mechanical brooms will cost $280,000 each. Complaints that the program would mean needing to move cars in neighborhoods where parking is at a premium previously gave officials pause on implementing large-scale street sweeping, though a 2017 survey pointed to police, potholes, and persistent litter issues as top concerns for Philadelphia residents.